Although there is a tremendous amount of negativity everywhere about Oprah Winfrey, I decided to take a few moments and compose some thoughts about this great woman with a beautiful spirit. It seems like everyone has some kind of opinion about Oprah. I have one also but elect to have a positive opinion about her. Regardless of whether you like her or not, her “rags to riches” story represents the quintessential American success narrative. Oprah makes me proud each time that I see her. Her life informs us that miracles can happen and that one can overcome experiencing severe traumas. When some African-Americans say that Oprah is not a “real Black woman,” it makes me so angry because they overlook the meaningful contributions she has made to Black people, including giving millions of dollars to Historically Black Colleges and Universities (HBCUs), and the reality that she played a significant role in the election of Barack Obama, the first Black President of the U.S. NAACP put her in its Hall of Fame. I listen to her acceptance speech of the NAACP Hall of Fame award every morning before I leave home. It’s so inspiring. If you have not listened to it, then you should search for it on YouTube. You will be so glad that you did. To the Black people who question Oprah’s authenticity, please stop this and recognize the love this woman has for Black people and everyone else too. I love how Oprah has become more and more open about her personal relationship with Jesus. On her shows, she will not hesitate to mention how much she loves Jesus or to suggest Jesus as a means of helping people to deal with difficult issues and problems. I really appreciate her transparency about her love of Jesus on and off of her show. Her love of Jesus is one of the fundamental reasons why she has been successful. This love of Jesus is evident through her tremendously giving spirit. She is not a billionaire who keeps all of her money to herself—she shares her money with others in a meaningful way. Oprah, you will be continuously blessed for giving to people so freely as you do. When people say that Oprah and Gayle, her bestfriend, are involved in a lesbian relationship, it makes me angry. Calling Oprah a lesbian just because she has a true friendship with Gayle suggests that such a relationship can only emerge from a sexually intimate relationship. This is such limited thinking. Although this is such limited thinking, many people engage in this limited thinking when it comes to Oprah’s friendship with Gayle. Grow up people! Move beyond the superficial and move toward the substantial. The haters of the true friendship Oprah has with Gayle simply long to have a friendship like the one they have. Oprah deserves your support and appreciation for the great things she has done for so many people. 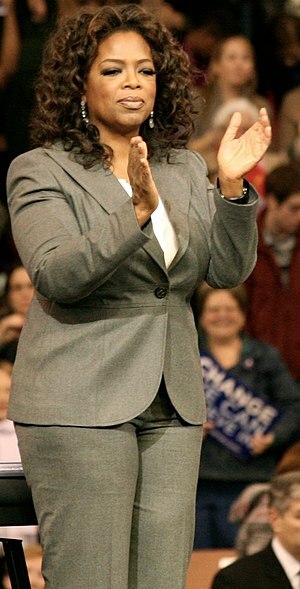 Today, Oprah, I salute you for being a great American and electing to be such a compassionate woman. I look forward to the many great things you will do in the future. Oprah, defines what it means to be an authentic giver. Her spirit and resiliency is rare and can not be found most anywhere. As much as some individuals criticize her graciousness in giving to others, they fail to highlight the powerful and groundbreaking business woman that she is. Her business savvy and swag is truly one for the history books. As you stated, “limited thinking” is at best the base of reasoning behind the negative opinions, not constructive criticism of what people have to say about, Oprah. At days end, this action is best affiliated with a good old-fashioned ‘hater’ and I can rest assure that Oprah simply does not give a damn! Great post. Pampered Sweet Tooth, Oprah is certainly a great American and a beautiful all-around person. If she was not doing really big things, then no one would even criticize her–that’s how we know she is making a difference and the Devil is just mad. Thanks for your response and for reading!